The roads were not plowed, so I had to walk to the bakery. That’s the adventure part. On the way I saw this rainbow snow, usually you just see yellow snow. Yellow because that’s where a dog has…… We even have a “Don’t Eat the Yellow Snow” song, thank you Frank Zappa. So I thought this must be pretty special snow, you can probably even eat it. But can you punctuate it? I’m not sure I can. 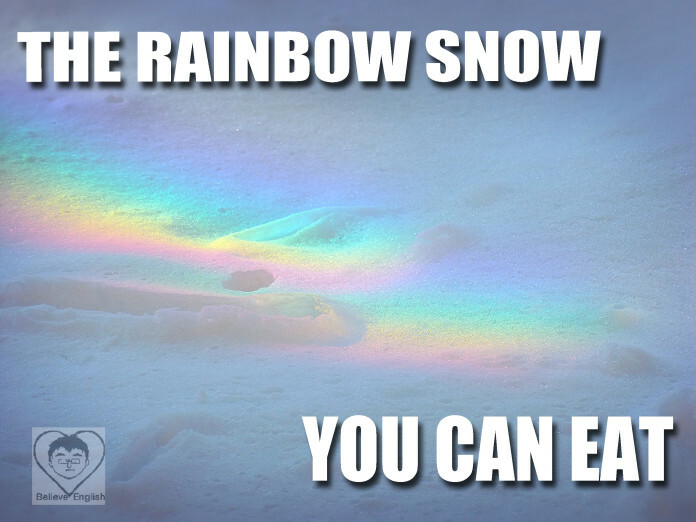 It is not a simple statement, “The rainbow snow you can eat.” It is a reflection on the known truth that there is yellow snow that you can’t eat; but, on the other hand, there’s this rainbow snow and….. How do you punctuate that? On the meme I cheated by spacing the words out over the picture. But cheating is wrong. Can you teach me how to do it right?